Independence Day is also unofficially known as barbecue-and-fireworks day--and while I can't help you grill a better burger, you've come to the right place if you're looking for some quick tips on taking better photos of your local pyrotechnics display. Believe it or not, it's pretty easy to capture dramatic and vivid fireworks in a photo. 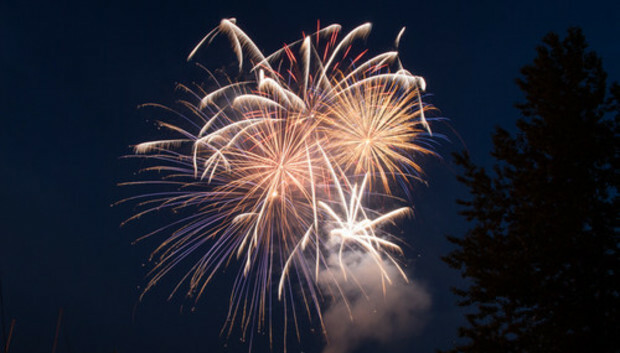 If you have a point-and-shoot or compact digital camera with a variety of scene modes, you're in luck--taking photos of fireworks should be fairly straightforward. Set the camera to Fireworks mode (you might need to refer to your user guide to see how to change scene modes), and your camera will use a slower shutter speed to help you capture light trails. That's the only camera setting you need to mess with. Since you're shooting with a slower shutter speed, keeping the camera steady is essential to prevent shake and blur. If possible, mount the camera on a tripod--even a lightweight one will do. No tripod handy? Steady the camera by leaning it on a wall, a chair, the hood of your car, or some other rigid surface. You might even want to carry beanbags to stabilize the camera, or use a gadget like The Pod, which is essentially a small beanbag with a tripod mounting screw built in. If your camera lacks a variety of scene modes, you can probably still get some good photos. Set your camera to Landscape mode, which sets the focus at infinity, and cover the lens with your hand at the very moment you press the shutter release so that the lack of light will encourage the camera to take a longer exposure. If you have an advanced compact camera or a digital SLR, you can use manual exposure controls to get a little more creative. Skip Fireworks mode and switch to Manual, where you can dial in the aperture and the shutter speed separately. Here's how to crack the code of manual exposure settings: When you're shooting light sources at night, the aperture largely controls the brightness of the lights, while the shutter speed determines how long the light trails appear in the photo. Start with f/8 and 2 seconds, and review your shots in the LCD display. If you want brighter fireworks, open the aperture by making the f number smaller. If the overall photo looks overexposed, make the f-number bigger. You can get great fireworks with a wide range of settings; don't be afraid to make the shutter speed much slower, as well. Now for the inevitable question: Can you get nice photos of fireworks with a smartphone? Unfortunately, smartphones simply aren't equipped for the rigors of taking fireworks photos. One limitation is their inherently wide-angle lens; another is their inability to control the aperture or shutter speed. However, with an app like Top Camera, which includes the ability to force your phone to use a slightly slower shutter mode, you can try to capture some fireworks. In doing that, remember to stabilize your phone, since holding it in your hand will inevitably give you blurry results. Once you get the hang of shooting fireworks, try setting the shutter speed to the Bulb setting, if you have one. Bulb leaves the shutter open for as long as you depress the shutter release, and it's a great way to make sure that you capture exactly what you see in the sky --you control when the exposure starts and stops. Be careful not to leave the shutter open too long, though, or you can get an overexposed mess. You can always review your last shot in the LCD display, though, to see how you're doing. If you have control over your camera's focus, set it at infinity and leave it there. The fireworks will likely be far enough away that the camera will focus at infinity anyway, and manually making the camera focus at infinity will save you time and frustration. Fireworks and Landscape modes do this for you automatically; with an SLR, you'll need to remember to dial the focus to infinity on your own. Also, leave the camera's ISO at the lowest setting--probably about 100--so that you can minimize noise, which will be worse than usual because of the long exposure times. Likewise, if your camera offers a noise-reduction feature, it's a good idea to turn it on.